About Time is a 2013 British romantic comedy-drama film about a young man with the ability to time travel who tries to change his past in hopes of improving his future. The film was written and directed by Richard Curtis, and stars Domhnall Gleeson, Rachel McAdams and Bill Nighy. It was released in the United Kingdom on 4 September 2013. The film received positive critical response and was a moderate box office success grossing $87.1 million against a $12 million budget. Tim Lake (Domhnall Gleeson) grows up in Cornwall in a house by the sea with his father James (Bill Nighy), mother Mary (Lindsay Duncan), absent-minded uncle Desmond (Richard Cordery), and free-spirited sister Katherine or "Kit Kat" (Lydia Wilson). At the age of 21, Tim learns from his father that the men of his family have the secret ability to travel back in time, to moments they have lived before. James discourages his son from using his gift to acquire money or fame, and Tim decides he will use it to improve his love life. The following summer, Kit Kat's friend Charlotte (Margot Robbie) visits. Tim is instantly smitten, but waits until the end of her stay to tell her how he feels; she tells him that he should have told her earlier. Tim travels back in time to tell Charlotte in the middle of the holiday, but she says it would be better to wait until her last day. Heartbroken, Tim realizes she is uninterested in him, and that time travel cannot change anyone’s mind. Tim moves to London to pursue a career as a lawyer, living with his father's acquaintance, Harry (Tom Hollander), a misanthropic playwright. Tim visits a Dans le Noir restaurant, where he meets Mary (Rachel McAdams). They flirt in the darkness, and afterward, Mary gives Tim her phone number. Tim returns home to find a distraught Harry, whose opening night of new play has been ruined by an actor forgetting his lines. Tim goes back in time to put things right, and the play is a triumph. Tim tries to call Mary, but discovers that by helping Harry, the evening with Mary never occurred. He recalls Mary's obsession with Kate Moss, and finds her a week later at a Kate Moss exhibition, but discovers she now has a boyfriend. Tim finds out when and where they met, turns up early, and persuades her to leave with him instead. Their relationship develops, and Tim moves in with Mary. He encounters Charlotte, who now seems interested in him, but Tim turns her down, realising he is truly in love with Mary. They marry and have a daughter, Posy. Kit Kat's difficulties in life and her drinking lead her to crash her car on Posy's first birthday. As Kit Kat recovers, Tim decides to intervene in her life: he prevents the crash and takes Kit Kat back in time to avert her unhappy relationship with Jimmy (Tom Hughes). They manage to return to the present, where Tim finds Posy has never been born and he has a son instead. James explains that they cannot change events prior to their children's birth and ensure that exact child will still be conceived. Tim accepts that he cannot change his sister’s life by changing her past; he allows the crash to occur, ensuring Posy’s birth, and he and Mary help Kit Kat improve her own life. She settles down with Tim’s friend Jay and has a child of her own. Tim and Mary have another child, a baby boy. Tim learns his father has terminal cancer that time travel cannot change. His father has known for some time, but kept traveling back in time to effectively extend his life and spend more time with his family. He tells Tim to live each day twice in order to be truly happy: first, with all the everyday tensions and worries, but the second time noticing how sweet the world can be. Tim follows this advice; his father dies, but Tim travels to the past to visit whenever he misses him. Mary tells Tim she wants a third child. He is reluctant because it means he will not be able to visit his father again. Tim tells his father that he cannot visit any more, and together they travel back to relive a fond memory from Tim's early childhood. Mary gives birth to a baby girl, and Tim knows he can never see his father again. Tim comes to realize that it is better to live each day once, and appreciate life with his family as if he is living it for the second time. Richard Griffiths as an actor, alongside Richard E. Grant, in his final film appearance. By Curtis's own admission the conception of the idea "was a slow growth". The genesis of the idea came when Curtis was eating lunch with a friend and the subject of happiness came up. Upon admitting he was not truly happy in life, the conversation turned towards him describing an ideal day. From here Curtis realized that the day of the lunch, for him, constituted such a day, which led to him deciding to write a film about "how you achieve happiness in ordinary life". Thinking that the concept was too "simple" he decided to add a time travel element to the film. Although the production contracted out various effect houses to try to make the time travelling effects feel like more of a spectacle, they found the resulting work "just completely wrong" tonally and instead focused on a more low key approach. Curtis has opined "that in the end it turns out to be a kind of anti–time travel time travel movie. It uses all the time travel stuff but without it feeling like it's a science fiction thing particularly or without it feeling that time travel can actually solve your life." Curtis has said the film was likely to be his last film as director, but that he will continue in the film industry. Zooey Deschanel had been in talks for the role of Mary but ultimately the role went to McAdams. The film was initially scheduled to be released on 10 May 2013, release was pushed back to 1 November 2013. The film premiered on 8 August 2013 as part of the Film4 Summer Screen outdoor cinema series at London's historic Somerset House. It was released in the United Kingdom on 4 September 2013 and in the United States in limited release on 1 November 2013 and in wide release on 8 November 2013. About Time received mixed reviews from critics. The review aggregation website Rotten Tomatoes gives the film a rating of 68%, based on 144 reviews, with an average rating of 6.3/10. The site's critical consensus reads, "Beautifully filmed and unabashedly sincere, About Time finds director Richard Curtis at his most sentimental." Metacritic, which uses a weighted mean, assigned a score of 55 out of 100, based on reviews from 34 critics, indicating "mixed or average reviews". Catherine Shoard of The Guardian compared the film to Groundhog Day noting it "is about as close to home as a homage can get without calling in the copyright team" and describes Domhnall Gleeson as a "ginger Hugh Grant", which "at first, is unnerving; as About Time marches on, Gleeson's innate charm gleams through and this weird disconnection becomes quite compelling." Shoard gave the film 2 stars out of 5. Robbie Collin of The Daily Telegraph praised the comic timing of McAdams and Gleeson, but criticised the film, comparing it to a quilt, calling it "soft, frayed at the edges, and oh so comfortable" and gives it a score of 3 stars out of 5. Leslie Felperin of Variety magazine called the film "reassuringly bland" and says there is sense of déjà vu especially for anyone who has seen The Time Traveler's Wife also co-starring McAdams. Unlike that film she has no knowledge of his powers, resulting in a "fundamental lack of honesty in their relationship". Felperin noted British reverse snobbery would put many off this and other Curtis films, but that this would be less of a problem among American Anglophiles and those willing to suspend disbelief, taking the characters as British "versions of Woody Allen’s Manhattanites (but with less angst)". Felperin praised the chemistry of the leading couple "that keeps the film aloft" and the supporting cast, while also criticising the stock characters as being too familiar. The film became a surprise hit in South Korea, where it was watched by more than 3 million people, one of the highest numbers among the foreign romantic comedy movies released in Korea. It grossed a total of $23,434,443 there, higher than in any other country. Mark Kermode observed that writer Curtis "sets up his rules of temporal engagement, only to break them willy-nilly whenever the prospect of an extra hug rears its head". Travelling back to a time before your child is born may cause a different child to be born and the original child to be lost. The Independent says the explanation of time travel is "shockingly inadequate" and that "Curtis keeps leaving questions unanswered – time and time again"
Steve Cummins of the Irish Post refers to Tim travelling backwards and forwards in time when he says the film is "riddled with plot holes"
Matthew Turner points out the "big problem is the unsightly pile-up of plot holes and logic problems"
Kate Erbland of Film School Rejects states "the rules and limitations of Tim's gift aren't exactly hard and fast, and the final third of the film is rife with complications that never get quite explained. Rules that previously applied suddenly don't apply ... the time travel rules aren't exactly tight and are occasionally confusing". ^ "About Time". British Board of Film Classification. ^ a b "About Time". The Numbers. Retrieved 2 January 2014. ^ "About Time (2013)". Box Office Mojo. ^ White, James. "New Pic of About Time: Richard Curts' new time-warping comedy". Empire. Retrieved 11 April 2013. ^ Kemp, Stuart. "'War Horse' Writer Richard Curtis to Direct Time-Travel Script 'About Time' for Working Title (Exclusive)". The Hollywood Reporter. Retrieved 11 April 2013. ^ Child, Ben (19 January 2012). "Richard Curtis decides it's About Time he directed a film about time travel". The Guardian. London. Retrieved 11 April 2013. ^ a b Rome, Emily. "Rachel McAdams rom-com 'About Time' gets new release date". Inside Movies. Retrieved 11 April 2013. ^ a b c Billington, Alex. "Interview: 'About Time' Writer & Director Richard Curtis on Happiness". Firstshowing.net. Retrieved 5 March 2017. ^ Child, Ben (July 31, 2013). "Richard Curtis: 'About Time will probably be the last film I direct'". The Guardian. ^ Pulver, Andrew (11 May 2012). "Rachel McAdams to star in Richard Curtis romcom About Time". The Guardian. London. Retrieved 11 April 2013. ^ Chang, Justin (2012-03-27). "Deschanel, Gleeson on 'Time' for Working Title". Variety. Retrieved 2013-09-08. ^ "Film4 Summer Screen: About Time Competition". Channel 4. Retrieved 2013-09-08. ^ "About Time (2013)". Rotten Tomatoes. Fandango Media. Retrieved 6 March 2018. ^ "About Time". Metacritic. CBS Interactive. Retrieved 4 October 2013. ^ Shoard, Catherine (8 August 2013). 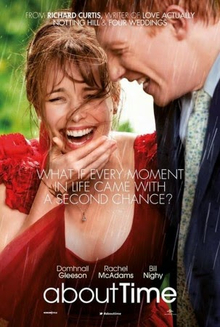 "About Time – first look review". The Guardian. Guardian News and Media. Retrieved 6 March 2018. ^ Collin, Robbie (8 August 2013). "About Time, review". The Daily Telegraph. Telegraph Media Group. Retrieved 6 March 2018. ^ Felperin, Leslie (8 August 2013). "Richard Curtis returns to a quintessentially English milieu with this sweet, familiar and reassuringly bland romance". Variety. ^ 김, 진성. "'어바웃 타임' 300만 돌파, '로코' 흥행 기록 다시 썼다". TV Daily (in Korean). Archived from the original on 18 March 2014. Retrieved 2014-01-05. ^ "International gross figures from Box Office Mojo". BoxOfficeMojo.com. Retrieved 4 August 2014. ^ Kermode, Mark (8 September 2013). "About Time — review". The Guardian. ^ Gibson, Megan (5 November 2013). "Plot-holes and Problems in Richard Curtis's 'About Time'". Time. Retrieved 19 October 2017. ^ Barber, Nicholas (30 August 2013). "Why time does not travel well in Richard Curtis' new film About Time". The Independent. London. ^ Cummins, Steve (6 September 2013). "About Time: Film Review". The Irish Post. ^ Turner, Matthew (4 September 2013). "About Time Film Review". ViewLondon.co.uk. ^ Erbland, Kate (1 October 2013). "'About Time' Review: Time-Traveling Charmer Arrives Right in the Nick". Film School Rejects. This page was last edited on 10 April 2019, at 16:31 (UTC).